As Britain leaves the European Union | Notes from the U.K.
What’s going on with Brexit, you ask? It’s been strange over here, and it’s getting stranger. First the prime minister set up a referendum on whether Britain should leave the European Union. Why? Because he wanted to shut up the anti-EU wing of his party, the Conservatives. Clever move, Dave. Then the whole thing went wrong, the Conservative Party dissolved into an internal arm wrestling match, and the country voted to leave the EU. Clever Dave announced that he’ll resign as soon as someone in his party wins the arm-wrestling match, which is now about who gets to replace him. 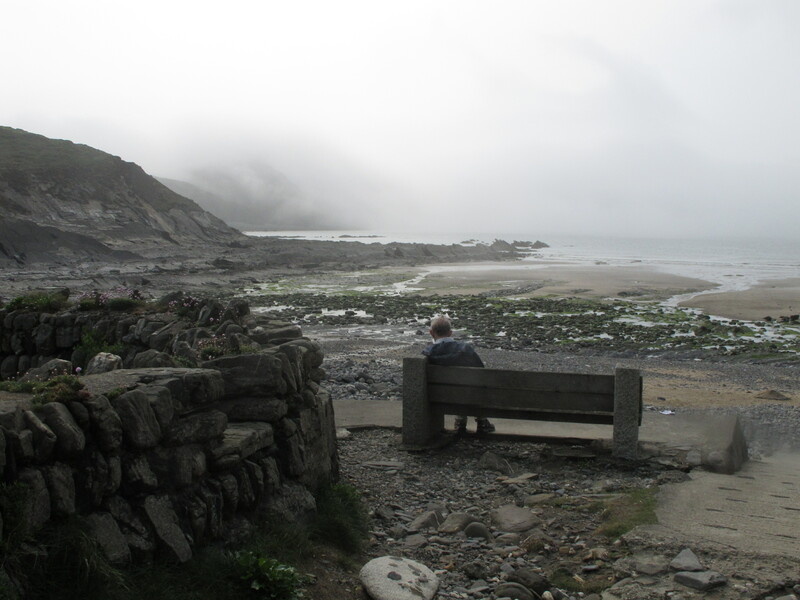 Moody and irrelevant photo: a man watching the fog roll in. Then the MPs who belong to the Labour Party, who you’d think would be out celebrating the Conservative-on-Conservative war, called for a vote of no confidence in their own leader, Jeremy Corbyn, who they’ve hated from the time he was elected because he’s from the left wing of their party and they’re not. They blame him for not making a stronger case for staying in the EU. Corbyn, who was elected by a large majority of the party membership, refused to resign. The Labour Party dissolved into an internal arm wrestling match. Actually, it started when Corbyn was first elected, but it’s gotten worse now. In the meantime, the Scottish National Party announced that it will demand a second referendum on Scottish independence. Most of Scotland voted to stay in the EU and now they want to leave the UK so they can. Then they read the small print on something or other and announced that the Scottish Parliament has the power to stop the UK’s exit. Who knew that? Apparently no one. A petition calling for a second referendum got so many signatures that the government web site that was hosting it broke down. In almost no time, it had several million signatures. Then a bunch of them turned out to be bogus. Still, that leaves a hell of a lot that aren’t. It turns out that the petition was started by someone who supported the Leave campaign but didn’t expect it to win. It was hijacked, he said, by Remain supporters. Well, yes, dear. both sides of that sword were sharpened. Dave—who, you remember, is resigning—says he won’t make the formal moves that will trigger the British exit. He’ll leave it to his successor. But the EU is calling on the UK to get on with it and end the uncertainty. They’re not in a good mood about all this, and they’d like the UK out of the room, please. The sight of us is bringing back ugly memories. But no one can trigger the Leave process except the country that wants to leave and that country–us–is stalling. One of the promises of the Leave campaign was that if Britain left, it would save so much money that it could spend £350 million a week on the NHS, which is seriously underfunded at the moment. A few days after the vote, however, all references to that disappeared from the campaign’s website. The top Leave campaigners have all developed amnesia and don’t seem to remember saying that. Meanwhile, the pound’s fallen to either a 30-year low or a 31-year low, depending on when you turned on your radio. The stock markets have gotten hives. Polish immigrants reported being handed leaflets telling them to leave now. Assorted other incidents of harassment against Muslims, Poles, and in one incident foreigners in general have been reported, although in that particular incident there may not have actually been any foreigners present. A man in the supermarket started yelling about foreigners and questioning people about where they were from. Keep in mind that when I say harassment of Muslims and Poles and foreigners, what I really mean is people who might be Muslims or Poles or foreigners, because it’s not always easy to tell. The same thing happens when people start pushing gays around: A few extra people who aren’t gay always get swept in because someone thinks they might be. It’s hard to tell who to hate these days, you know? This may actually be good, because it reminds people who aren’t in any of those categories what it’s like to be the target of that kind of venom. Some very ugly forces have been unleashed in this campaign. A lot of the Leave campaign was about “taking our country back.” Who from? It was a kind of fill-in-the-blank slogan. From whoever you think took it from you. For some people, that was an urban elite, because this was a heavily anti-elitist campaign—run by an urban elite who hope to take power from a different urban elite. For other people, it was foreigners, or Muslims, or Poles, or Eastern Europeans in general, or Asians or Africans, or people whose ancestors were Asian or African. It took some of the ugliest threads of the culture and brought them out into the open. Suddenly they felt respectable. Want to yell at foreigners in the supermarket? Want to yell at a young Muslim woman on the bus? The country just told you you could. It didn’t, but never mind. A certain number of people feel like it did. The part of the Leave camp that I’m sympathetic to is made up of people whose lives have been bulldozed by globalization. Steady jobs disappeared, industries have moved abroad, and people are left broke and lost and angry. They want to take their country back too. Unfortunately, I don’t think they’ll get it. Not this way. According to a Guardian article, the Bank of America and Pimco, which I never heard of before, are “warning their clients that the gulf between rich and poor could add to the anti-establishment backlash,” and they consider the Brexit vote part of that. The queen, by the way, is due for an automatic £2.8 million raise in pay unless the formula that calculates what taxpayers owe her is changed. That’s not related to leaving the EU, but I thought I’d toss it in anyway. Here in Cornwall, where money’s tight and the EU has invested a lot and where the vote leaned heavily toward Leave, the Cornwall Council turned to the national government asking if they’d match that investment. Part of the Leave campaign’s promise was that once the UK didn’t have to pour money into the EU, it could be spent here. To which I can only say, don’t count on it. The NHS won’t be getting any £350 million a week. If Cornwall gets any equivalent of the EU investment, I’ll be surprised, she said in a massive display of understatement. One of the main Leave campaigners, Boris Johnson, wrote in the Telegraph that, basically, nothing good will change and only the bad things—the British involvement with the EU’s bureaucracy—will drop away. And no one will get colds or flu again, ever. I’m paraphrasing heavily, but I think I’ve caught the spirit of the column. Commentators are starting to comment that the Leave campaigners don’t have a plan. We might have been wise to ask them about that a bit earlier, although I doubt it would have changed the vote. I haven’t written about the referendum until now because it was hard to find anything funny about it. Now, though? It’s still not funny, but the situation’s weird enough to give me something to work with. I apologize for not giving you links. There are too many. I’m overwhelmed. And in no time they’ll be outdated. In fact, I’m publishing this before my usual Friday deadline because it’ll be out of date otherwise. This entry was posted in Politics and tagged Brexit, Britain & the EU, referendum by Ellen Hawley. Bookmark the permalink. Great to laugh in the midst of this revolting chaos! We might as well. It won’t make things any worse. Sounds just like something taken out of the Donald Trump playbook. Empty talk and utter lunacy. The only other thing I have to say is, I think the photo is actually quite relevant. You’re right about the photo, and I confess I thought about making some sort of connection but thought I’d be too obvious. I have heard that some people voted to send a message and didn’t really plan to win, but I wasn’t sure if that was just people talking or if some real people really felt that way. Thanks for the reality check. Ellen, “Who,What,Where,Why?” has asked me to pass on a request for them to put this out on their weekly summary. I don’t know if you are familiar with that weekly journalistic enterprise, but it does good work. I’m not familiar with it, but I’d love it if they’d include it. Would you ask them to send me a link? Thanks. Spiffing post from our lass in Cornishland. You have summed the whole thing up extremely well. I knew we were all in trouble when I heard someone say that he voted leave because we would them have full control of how we fought our wars. Yes … hand-grenades or hot-dogs. I voted STAY 100%. So … Out of Europe, out of the European Cup, did absolutely crap in the Eurovision Song Contest. Great, no. Grate, yes. Still, on the hopeful side, Brexit may still not happen. We can still change our minds. We can just sit on the European naughty step for a few months and pretend that it never happened. I have black friends. A couple of Polish friends. Some gay friends. Muslims friends. I don’t have any gay black Muslim Polish friends. Until we meet again, my best to you. Kris. Sitting on the European naughty step for a couple of months. Now there’s a great contribution to the discussion. I’d love to see the concept get some national play. I only wish I was in a position to make that happen. It’ll be fine.. I predict a U-turn. quite soon. (Nostadamus). I predict street parties/ street riots. Cameron will sit on the naughty step in a remote German fairy tale castle and Angela M. will cover him with whipped cream and she will lick it off. Boris will be made to witness the whole thing dressed as a donkey. I don’t think the finer details have been ironed out yet. Would you run for office? You’d be fantastic. Well I would …. but I am busy sorting out the Greek situation at the moment. That will probably take just a little while. I wondered who was in charge of that. This won’t be easy, will it? I was hoping for something from you Ellen, you did a great job of recaping, Naughty step’s funny, except that’s a much too easy way out – oops, I mean in – from messing with the lives/futures of the rest of us on the Continent? Ok, I’m being hateful too, but I’ve been following this whole farce for months – even did an online course on the subject last month- as I was wary Brit sense of humour would get the best of them at the polls. Actually it turned out to be ignorance. And do read Boris Jonhson’s “The Churchill Factor”: no way Johnson could have remotely wanted the referendum to be successful, it was just his contribution to his party’s inside row and way up the ladder. Arrrgh. Did you know the Queen was at the year’s most fashionable wedding over the weekend? Lovely peach coloured ensemble. I wonder if she managed to see the European Championship match on TV? Though the sinking £ pound may not touch the hearts of UK – or UUK as in un-united ? – masses, the harbinger of things to come in Brit football stadiums just might make them realise they’ve all tripped over their own anti-foreigner swords. We are all Icelanders, yeah! Nous sommes tous Icelandic? Icelandique? How do you say Iceland in French? Thanks. It’s a word I never even noticed I didn’t know before. Thanks for this. I’m going to reblog it for the benefit of friends who are considering voting for Trump. I fear for all of us. Hey, I saw that Boaty McBoatface reference just a few minutes before reading this post. Yours is probably the best, most succinct summary of the situation yet. And funny. Thanks. Not being an expert on anything beyond the placement of commas (and I question my competence about that), I hesitated to write about it. But since the experts are leading us over a cliff, why not? And here in Hellfire Corner the racists have been out on the streets pre and post said referendum knowing they have the audience of those who ticked the same ballot paper box. Bad times indeed…well constructed piece you have compiled here; fine read indeed. My thanks to Leslie to pointing me in your direction. And my thanks to you for wandering this way. That’s a scary report, though. Cameron doesn’t want any part of what happens next, which is why he isn’t triggering the withdrawal. Once that happens, negotiations start, and he doesn’t want the blame. I have a hunch you’re right about Boris and Co. waking up, discovering they won, and thinking, Oops. Now what do we do? If politics were nothing more than a game to see who would mess up their country the worst, right now, the Brits have the lead. But the Americans still have a Trump card. the entire world is going insane – we’re just the inmates in the asylum. We are getting into very, very weird times. Indeed. Fasten your seat belts. Or did I already say that? I’ve been wondering what your take on this ridiculous and devastating situation would be as someone who is both an “outsider” yet profoundly effected by the possibility of this whole ugly mess reaching its conclusion. Needless to say, I’m sure, I voted Remain. As did all but three people I know. I choose my friends wisely it seems. People who protest vote when there are only two options baffle and confound me and make me question the merit of universal suffrage. I’m hoping somehow the breaks are put on but I’ve not got much room for hope right now as I’m just too devastated and livid about the result. I actually felt sick when watching the results come in. “Taking Britain Back” is just like Trump’s proclamation of making America “great again”. It’s about a return to one particular vision of a nation and its one that’s profoundly backwards, reactionary, homogenous, riven with prejudice, erodes basic rights, and benefits the haves while chewing up and spitting out the have nots. It’s obviously not a vision I share. It’s a vision that terrifies me. As a parent it petrifies me. What world are my kids inheriting? Other than that wonderfully creative list of swear-filled replies to Donald Trump’s tweet about Scotland going “wild” about Brexit, I’ve yet to find the funny side in any of this either. I don’t have kids, but I’ve been an extra adult to any number of kids throughout my life and I feel the same way about the world we’re leaving them. It does scare me. And the whole take-our-country-back theme on both sides of the Atlantic? Someone said a country’s a block of land held together by a misunderstanding of its history and a hatred of a neighbor. That greatness is surely a wish to go back to a time that never was. I think there’s a problem with referendums (referenda?) in a democracy based on representation. They give people power without responsibility, which is exactly what’s happened with the EU Referendum: many people used it as an opportunity to stick two fingers up at an establishment that they feel has let them down, said establishment not being the EU at all, but rather the British governing elite. The politicians now have to pick up the pieces – and they’re too busy engaged in their own power struggles now to do that responsibly. The point behind a representative democracy like that of the UK or the USA is that the electorate choose representatives (Members of Parliament in the UK) to represent them but not necessarily do everything that particular sections of the electorate want. The representative has to take responsibility for his or her decisions, and is subject to the scrutiny of their peers (e.g. Parliament). If, at the end of their term, the electorate think their representative has followed his or her own agenda too much, at the expense of the electorate’s interests, they can vote them out. It’s not a perfect system, but it does have the merit of ensuring relative stability. Referendums can have the opposite effect – which is what we see with the chaos in the UK right now. The irony is that the leave vote was not that much greater than the remain one: 52% to 48%. As Ellen points out in her excellent, succinct summary, this has all come about because of an ongoing row within the Conservative party – posh boys having a ding dong carried over from the public school dorm. It’s been going on since Margaret Thatcher’s days in fact, and has now come to the boil with disastrous consequences. I’ll put my stake in the ground and declare that even worse than Brexit is the prospect of a Conservative government with Michael Gove as Prime Minister, and no effective opposition because the Labour Party is busy tearing itself apart. The true Armageddon is Donald Trump becoming President of the USA. Excuse me a minute while I slit my wrists, would you? I think your assessment is absolutely spot on. To treat something so massive as EU membership as a straw poll and especially at a time of discontent and disengagement was not just risky but foolish. The possibility of Trump as president here is unbearable. We had discussed returning to the UK if Trump won but now Britain has decided to implode we are stuck between a rock and a hard place. It’s a mess on both sides of the Atlantic. This was one of the most cogent descriptions of what happened. And I’ve read a lot. Good luck — I hope that the “Leavers” get their pennies from heaven, too. Thanks. That’s a little scary, frankly, since I’m–well, just someone sitting in front of a keyboard in Cornwall. I hadn’t, but it’s good. Thanks. Yep. John Oliver adds some down-to-earth Brummie wit and sarcasm. Let’s make him Prime Minister! Oh, we can’t – he’s in America. At this point, I’m not sure anybody’s in a position to quibble. i know. we stole him. we have to have some bright people here for our own clusterfucks? who better to mock the absurdity of our vain country than someone from outside, esp. with a British accent? Perfection, if you ask me. These are times when a sense of humor is required. I don’t pretend to know what’s right for any country, but bigotry, hatred, discrimination and racism are wrong. They’re always wrong. Isn’t that “maths” or are you guys leaving the ‘s’ in Europe. BTW, I love the line about asking the same people who chose “Boaty McBoatface” – that’s a good point. There goes the humor again. Seriously, I am concerned with what seems to be a new comfort with prejudice around the world. It’s not like we made all that much progress, but to lose any ground at all is really sad. Somehow when we move backwards we notice how much progress we actually had made. And no, I’m afraid we’re packing up the S and taking it with us. One more way for my accent to make me stand out. Anyway, thanks for a very readable summary of the whole shambolic shebang. On the other hand, if the EU survives the refugee crisis and the concomitant surge in nationalism(s), it could emerge stronger from all of this. The country which used to veto everything seemingly just for the hell of it, is finally gone. The rest can move forward. The great irony is that the UK will have to contribute pretty much the same amount of money they did before in order to maintain market access (just as Norway and Switzerland do) but without having any say in the running of it. We’ll see how it all pans out. We do live in interesting times. We do indeed. I hadn’t known that about the money Norway and Switzerland have to contribute. Ironic. The Leave campaigners haven’t really felt they had to do more than assert things. We’ll untangle from the bureaucracy. Good stuff will stay. Bad stuff will go away. Life will be good. And I’ll once again have the knees I had when I was twenty. Norway and Switzerland pay into something called “structural funds”, if you want to look into that side of things… I need to do some more reading, too. It never ends. It would’ve been really nice if both the Leave and the Remain campaigns had done some of that reading ahead of time. This was one of the most frustrating things for me, everyone in the Leave camp was saying “we can be like Norway”, while not mentioning the amount of money they contribute, the free movement of goods and people that they had to sign up to and the lack of vote they have in anything. Even the Prime Minister of Norway said “you don’t want our deal” . The electorate was massively uninformed, and misinformed. I just read an interesting article about referendums in Oregon, where apparently they’ve created a neutral body whose job it is to inform the electorate about the issues they’re voting on. What a novel idea. Sadly, you’re right. Lonely and looking out into the fog. Thanks for that. I’m grateful for all of them. I read this from Nana N’s reblog, but would have got to it anyway. A superb summary. The gap between the Westminster bubble and people on the ground is getting wider and wider. If there is a general election and both main parties state they want to remain in the European Union, millions of people will have no-one to vote for. That would be a serious failing of the democratic system. I’ve been wondering if the Labour Party’s going to split into left and center. Not that that would address the division you’re talking aabout directly, but it might address some of the anger. May we live in interesting times. We live in interesting times indeed! It is fascinating. There have been previous attempts to redefine the centre ground with splits from Labour towards the Liberals without any success. I have suspicion that the UK will remain in the EU. If Teresa May or another pro-EU MP becomes Prime Minister, they may force an early general election. If they win, they will claim a mandate to stay as we are. If they lose, it becomes a problem for the Labour Party. Boris has no future. The assassin rarely gains the throne. If he fails to become PM he is finished. If he becomes PM but stays in the EU, he is finished. If he becomes PM and takes us out of the EU with a poor result, he is finished. I think you’re onto something. These must be fun days to be a political reporter. Just heard – Boris is finished!! I heard that too. Speculation here runs from “he’s trying to let someone else take the blame” to “someone’s got something on him.” I wonder how long it’ll be before we really find out. “Strange” would seem to be the best word for this whole situation. Strange and confounding…I’m sorry that it’s a bit hairy right now…will stay tuned for your upcoming posts. I’m not sure how much more of this I’ll cover. We’ll just have to see how it all unfolds. The last line did give me a chuckle about this rather revolting development. Pity that the blame is shifted to those who probably had the least to do with things instead of those who have sucked all the air out of the economy. On a different note, I’ve read that Texas is now considering a Texit. I think I would encourage that one seeing as how it gave us Bush II and other goofy politicos. I’d like to keep Wendy Davis, though. From what Wild Thing tells me, people there never really did stop talking about a Texit. The real change now is that it has a different name. True. I’ve been hearing mutters from down there for years, but I thought it was cute that they picked up on mimicking the Brexit bit. Perhaps it’ll inspire them to follow the Brexit lead. That could be nice. Even nicer if they took a few other southern states with them. Not so nice for the more sane folks living there, though. I’m not sure this is a good idea, Gunta. It worked out really badly last time. I didn’t blog on it because a) it was horribly vitriolic anyway, b) I was afraid that it would all end in tears and c) it has all ended in tears. And it’s a long way from over. I’m afraid that’s very true. In a break from my usual transmission my current life in the USA is pretty much defined by trying to explain what just happened in Britain. I really can’t, except to say that Cassandra like I was quiety muttering Boaty Mcboatface for many weeks before the Brexit. So instead I’m going to point you to my favourite blog on the internet, because when it comes to things like this nobody does it better. Many thanks for that. And in the meantime, it’s only getting stranger around here. All true. I’m a witness. But it’s still all pretty jaw dropping. I was shocked when i found out the result. I voted remain along with the majority of Scotland. I was appalled by the leave campaign and it’s blatant racism and bigotory towards migrants. Basically the leave campaign made migrants ( and Eu) out to be scapegoats as well as blaming them for all the poverty, unemployment, NHS waiting !ists and lack social housing when in actual fact its our own successive governments that have contributed to this. Migrants put more into the country than they take out. Also the Eu has helped fund projects in some of the deprived areas in the UK. Corbyn should have done a lot more to highlight to his voters what the Eu has done or provided them and had an active role on the remain campaign. Although its known that he dislikes the Eu very much. The leave campaign has basically given the go ahead to people to attack migrants. I have never been so disappointed to be British but at the same time so very proud to be Scottish. I dislike SNP and Nicola Sturgeon but she seems to be the one with one with a plan! Her speech last Friday was really good too. I haven’t known much about the SNP, but Sturgeon is impressive. Here in Cornwall there’s some talk about independence, although the (slightly) more practical talk is about devolution. I’m sympathetic to the impulse, but having spent most of my life in America I haven’t been impressed by the results of state government, which is the (very) rough equivalent of super-devolution. State governments can be and often are corrupt, pig headed, self-serving, etc. etc. Moving government closer to home isn’t in itself a solution. Mind you, I’m not sure anymore that I know what is. Absolutely. The issues that caused many “have-nots” to vote for Brexit are caused by policy failures by successive UK governments, from Margaret Thatcher’s time to today. But a) the politicians responsible for this don’t want to admit it, and b) the right-wing press, lead by the Daily Mail have consistently sold lies and distortions, to the have-nots, particularly about immigration and the EU, with “barrow boy” Farage egging them on. True. And a damn shame. Well Australia just mucked up their elections leaving unworkable chaos. Just looking here and the UK and the USA, how many multi-million people and these countries cannot find a strong level headed leader. ??? Setting aside all impulses to joke, it scares me. It’s under these conditions that it’s easy for people to decide that what we need is, basically, a strongman–a Putin, a Mussolini, a whoever. I hope we can all avoid that. That was actually quite funny. More importantly, someone else who sees that this bloody referendum was only to shut up the eurosceptics of the Tory party and had nothing to do with what was good for us, the people. Good for the people? I’m guessing that comes so far down the list of priorities that they jammed it in somewhere in 4-point type.